It Is’t Calgary But It Feels Like It Today! The chilly view from a dock next to the Maritime Centre this morning. 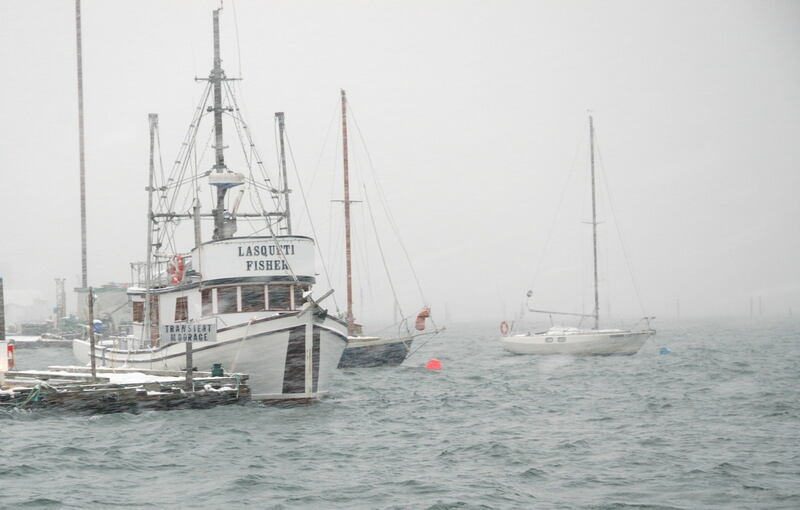 Lasquiti Fisher, tied to the dock, belongs to members Tony and Alma Owen. Temperatures hovered around -5C today in Cowichan Bay and by lunch time we had about 10 cm of snow. Hopefully the forecasters have got it right and it will all be gone by the weekend! A block is screwed to extended frame to hold the gunwale inplace. 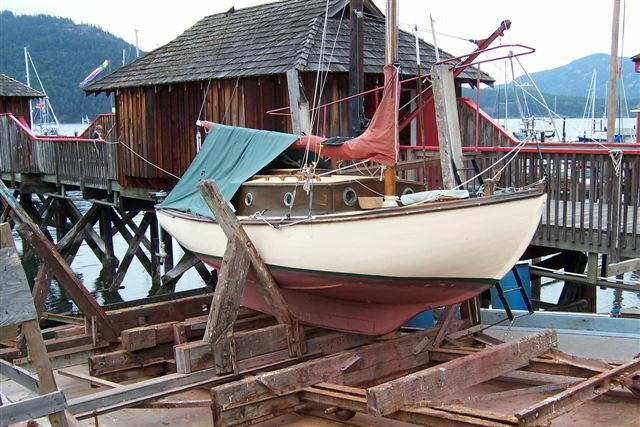 We have some nice, tight-grained Douglas Fir gunwales, (3/4″ X 1 3/4″) for the Bolger Dory. We decided not to use fastenings and instead use as many clamps as we could rustle-up to hold the gunwales in place while the epoxy cured. 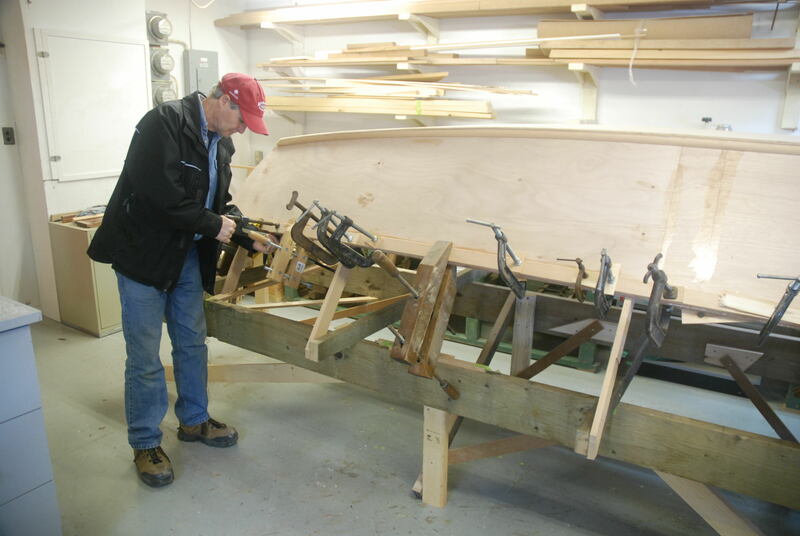 However, epoxy is a great lubricant until it’s squeezed from a joint, and without screws to locate the gunwales, we had ensure they didn’t slide around as we clamped them in place. This could be tricky, as the gunwales needed to be bent with considerable force in two directions to conform to the sheer of the boat. 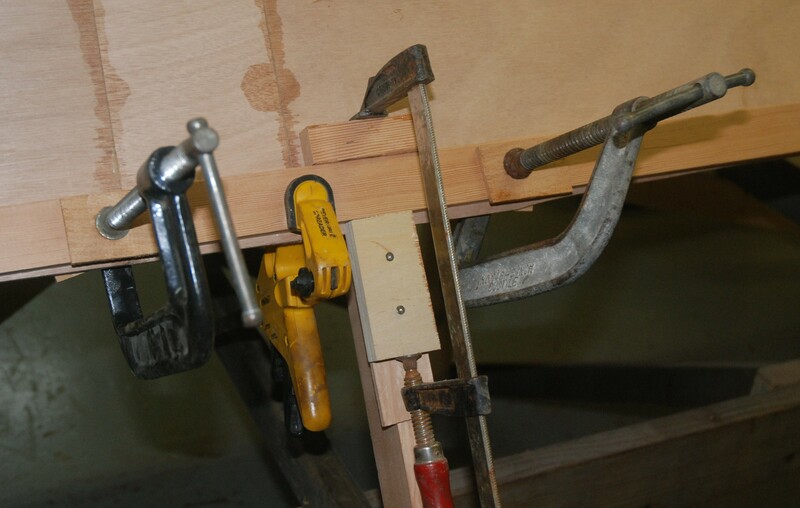 So we screwed a locating block to each of the extended frames (which will be cut-off when the boat is removed from the building jig) and used these with clamps to hold the gunwales into place (see picture above). Bob and Brian made a “dummy run” with clamps and blocks before doing it for real which is a great way off ensuring the process goes smoothly and avoids last minute scrambles for extra clamps, rope, wire or anything else needed to “tame” a highly stressed piece of lumber! It went very well and once we turn the hull over any plyood proud of the gunwales will be removed using a router and pattern bit. 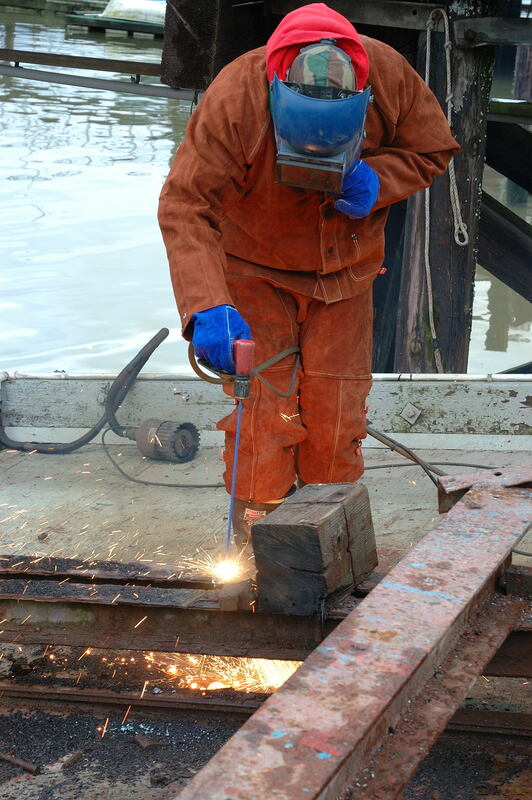 Brian makes a "dummy run" to make sure things go smoothly when we use epoxy.